Michael’s House | The Jamestown Comet. 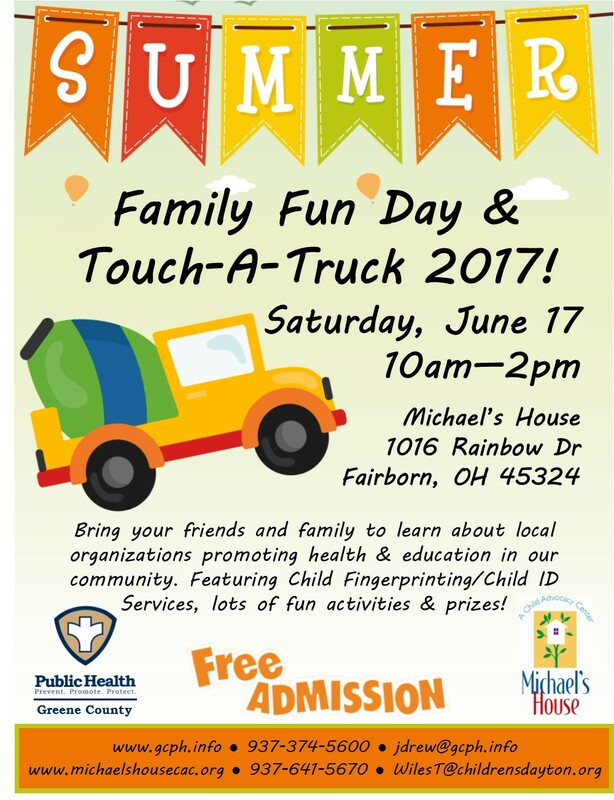 XENIA, OH – This year, Greene County Public Health is proud to partner with Michael’s House in Fairborn to host Family Fun Day & Touch-a-Truck on Saturday, June 17th from 10:00 a.m. to 2:00 p.m. at Michael’s House located at 1016 Rainbow Ct. in Fairborn. The event is FREE and open to the public. Click to download the flier. For thirteen years, the event planned by Greene County Public Health was called the Family Fitness Challenge and it introduced children and their families to proper nutrition and the importance of physical activity. By partnering with Michael’s House, it opens the door for additional activities for families, including a Touch-a-Truck event. Michael’s House is Greene County’s advocacy center for child victims of abuse and neglect. Its mission is to provide a multidisciplinary team response to child abuse to protect and support children and their non-offending family members, hold offenders accountable, and educate the community. Greene County Public Health’s mission is to prevent disease, protect our environment, and promote healthy communities and wellness in Greene County. Injury prevention and the overall wellbeing, as well as the mental and physical health of our youngest residents in Greene County, is a huge part of that mission, which makes this partnership even sweeter. The team of professionals at Michael’s House work together to ensure children are kept from further harm, provide an immediate comprehensive response to child abuse victims, and educate the community to better recognize, respond to, and prevent child abuse. Necessary medical, emotional, legal, investigative, and victim advocacy services exist in one child-friendly location, ensuring that children are not further victimized by the systems intended to protect them. This reimagined event is designed to motivate and challenge youth and families to engage in healthy lifestyles both physically and mentally. Participants can visit fitness stations (including a fun bounce house) and interactive health information booths, fill up their “passport”, and receive a free prize (while supplies last). Child fingerprinting and ID services, healthy snacks, fun games, and prizes will round out the day. For more information, call contact jdrew@gcph.info or wilest@childrensdayton.org. The event is also on Facebook, just search for Family Fun Day & Touch a Truck 2017.